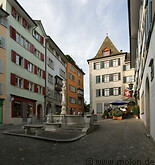 Zurich has an interesting and well-preserved old city. This extends on both banks of the Limmat, the river which drains the lake of Zurich. On the right bank of the Limmat are the old town hall, the Grossmünster in romanesque style, the guild houses on the Limmat waterfront and several other buildings from the past centuries. On the left bank of the Limmat there are a number of churches and the fashionable Bahnhofstrasse shopping street.